Truncus arteriosus is a congenital (present at birth) defect that occurs due to abnormal development of the fetal heart during the first eight weeks of pregnancy. The heart begins as a hollow tube, and the chambers, valves and great arteries develop early in pregnancy. The aorta and pulmonary artery start as a single blood vessel, which eventually divides and becomes two separate arteries. Truncus arteriosus occurs when the single great vessel fails to separate completely, leaving a connection between the aorta and pulmonary artery. Another congenital heart defect that nearly always occurs with truncus arteriosus is a ventricular septal defect, which is a hole in the dividing wall (septum) between the two lower chambers of the heart known as the right and left ventricles. Normally, oxygen-poor (blue) blood returns to the right atrium from the body, travels to the right ventricle, then is pumped through the pulmonary artery into the lungs where it receives oxygen. Oxygen-rich (red) blood returns to the left atrium from the lungs, passes into the left ventricle, and then is pumped through the aorta out to the body. In truncus arteriosus, however, oxygen-poor (blue) and oxygen-rich (red) blood mix back and forth through the ventricular septal defect. This mixed blood then flows through the common truncus. From there, some of it will flow through the part of the truncus that becomes the pulmonary artery, and into the lungs. Some of the mixed blood will also go to the part of the truncus that becomes the aorta and continue to the body. The mixed blood that goes to the body does not have as much oxygen as normal, and may cause varying degrees of cyanosis (blue color of the skin, lips, and nail beds). 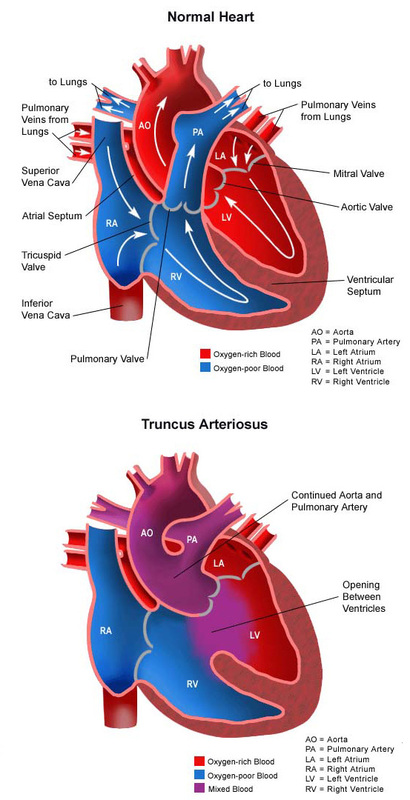 Truncus arteriosus is uncommon, and affects less than 1% of all cases of congenital heart disease. Some congenital heart defects may have a genetic link causing heart problems to occur more often in certain families. Other times this heart defect occurs by chance, with no clear reason for its development. Why is truncus arteriosus a concern? The blood that passes through the common truncus has less oxygen than normal. Oxygen-poor (blue) blood from the right ventricle and oxygen-rich (red) blood from the left ventricle mix together before entering the common vessel. Some of this mixed blood will go into the aorta and on to the body, producing some degree of cyanosis (blue color of the skin, lips and nailbeds). The pulmonary artery section of the common vessel gets more blood flow than the aorta does because the pressure is lower in the lungs than in the body and it is easier for blood to travel in that direction. If not repaired, the blood vessels in the lungs will become damaged by long-term exposure to the extra blood flow. As the pressure in the blood vessels in the lungs becomes higher, less blood goes to the lungs and more goes to the body. Cyanosis can worsen as blood with lower amounts of oxygen travels to the body. The symptoms of truncus arteriosus may look like other medical conditions or heart problems. It is important to speak with the child’s doctor if you suspect he or she may not be well. A pediatric cardiologist specializes in the diagnosis and medical management of congenital heart defects, as well as heart problems that may develop later in childhood. The cardiologist will perform a physical exam, listen to the heart and lungs, and make other observations that help in the diagnosis. The location within the chest that the murmur is heard best, as well as the loudness and quality of the murmur (such as, harsh or blowing) will give the cardiologist an initial idea of which heart problem the child may have. – Diuretics. The body’s water balance can be affected when the heart is not working as well as it could. These medications help the kidneys remove excess fluid from the body. – ACE (angiotensin-converting enzyme) inhibitors. These medications dilate the blood vessels, making it easier for the heart to pump blood forward into the body (instead of into the lungs). – Digoxin. A medication that helps strengthen the heart muscle, enabling it to pump more efficiently. – High-calorie formula or breast milk. Special nutritional supplements may be added to formula or pumped breast milk to increase the number of calories in each ounce, thereby allowing the baby to drink less and still consume enough calories to grow. – Supplemental tube feedings. Feedings given through a small, flexible tube that passes through the nose, down the esophagus and into the stomach, can either supplement or take the place of bottle-feedings. Infants who can drink part of their bottle, but not all, may be fed the remainder through the feeding tube. Infants who are too tired to bottle-feed may receive their formula or breast milk through the feeding tube alone. – The pulmonary arteries are detached from the common artery (truncus arteriosus) and connected to the right ventricle using a homograft (a section of pulmonary artery with its valves intact from a tissue donor). Occasionally, a conduit (a small tube containing a valve) is used instead of a homograft (human tissue valve). – The ventricular septal defect is closed with a patch. Learn more about heart surgery at CHOC. How are children cared for in the hospital after surgical repair? At CHOC, children spend time in our cardiovascular intensive care unit (CVICU) after truncus arteriosus repair. During the first several hours after surgery, the patient is very drowsy from the anesthesia that was used during the operation, and from medications given to relax him or her and to help with pain. To help the child rest, these medications might be continued overnight or longer. As time goes by, the child will become more alert. Ventilator. A machine that helps the child breathe while he or she is under anesthesia during the operation. A small, plastic tube is guided into the windpipe and attached to the ventilator, which breathes for the child while he or she is too sleepy to breathe on his or her own. After a truncus arteriosus repair, some children may remain on the ventilator for up to several days so they can rest, while others may be able to breathe on their own within a few hours of the surgery. The hospital care team will provide families with information on how long they expect the child to need a breathing tube. Intravenous (IV) catheters. Small, plastic tubes inserted through the skin into blood vessels to provide IV fluids and important medicines that help the child recover from the operation. Arterial line. A specialized IV placed in the wrist or other area of the body where a pulse can be felt, that measures blood pressure continuously during surgery and while the child is in the CVICU. Urinary catheter. A small, flexible tube that allows urine to drain out of the bladder and accurately measures how much urine the body makes, which helps determine how well the heart is functioning. After surgery, the heart may be a little weaker than it was before, and the body may start to hold onto fluid, causing swelling and puffiness. Diuretics (medicine to increase urine volume) may be given to help the kidneys remove excess fluid from the body. Chest tube. A drainage tube will be inserted inside the chest to drain blood and fluid that would otherwise accumulate after the incision is closed. Bleeding may occur for several hours, or even a few days after surgery. Heart monitor. A machine that constantly displays a picture of the child’s heart rhythm, and monitors heart rate, arterial blood pressure, and other values. Some patients may need other equipment not mentioned while in the CVICU, or afterwards. Hospital staff will explain all of the necessary equipment as needed. Patients are kept as comfortable as possible with several different medications—some relieve pain and relieve anxiety. Hospital staff will ask the child’s parents for their input on how to best comfort and soothe the child. As the child recovers, they will begin eating, being out of the bed in a parent’s lap, or walking (if they are old enough). Before the child is discharged from the hospital, parents will learn how to care for the child at home. The staff will provide instructions regarding medications, activity limitations and follow-up appointments before the child is discharged. How is a child cared for at home after discharge? Most infants and older children feel comfortable when they go home. Pain medications, such as acetaminophen or ibuprofen, may be recommended to keep the child comfortable. The child’s physician will discuss pain control before leaving the hospital. Often, infants who fed poorly prior to surgery have more energy after the recuperation period, and begin to eat better and gain weight faster. High-calorie formulas may be needed for several weeks or months after surgery to help the child catch up growth-wise. Tube feedings may also be helpful until the child is able to feed better. After surgery, older children can usually handle small amounts of light activity. Right after surgery, children may become tired easily and sleep more than they did before the procedure. Within a few weeks, however, the child may be fully recovered. Parents may receive additional instructions from the child’s physicians and the hospital staff. What is the long-term outlook after truncus arteriosus repair? Most children who have had truncus arteriosus surgical repair will live healthy lives. Activity levels, appetite and growth will eventually return to normal in most children. Future intervention may be necessary if the pulmonary artery branches were small and do not grow well after surgery. The homograft or conduit connecting the right ventricle to the pulmonary artery will also need to be replaced in the future as the child grows. Surgery in young adulthood is often needed to replace the conduit and/or the valve. The child’s cardiologist may recommend that antibiotics be given to prevent bacterial endocarditis because of the homograft or conduit. The experts at the CHOC Children’s Heart Institute will follow the patient throughout childhood and into early adulthood to monitor the child’s ongoing health. Regular follow-up visits with the child’s cardiologist are crucial to maintain the child’s health. Families are encouraged to learn more about CHOC Children’s and our exceptional services for children with a full spectrum of heart conditions, including tetralogy of Fallot.